To read the effusions of thanks offered Perry, one might be forgiven for thinking that he beat the British all by himself. In fact, he commanded a squadron of nine vessels mounting a total of 54 guns manned by approximately 585 seamen and marines. As is so often the case, many of these men have faded into history without a trace, but for a few, their stories are there waiting to be uncovered. As detailed in a previous post, two contingents of about 150 of Constitution’s veteran seamen marched to Lake Ontario and Lake Erie in the spring of 1813. Perhaps as many as fifty of these men were present on September 10th. 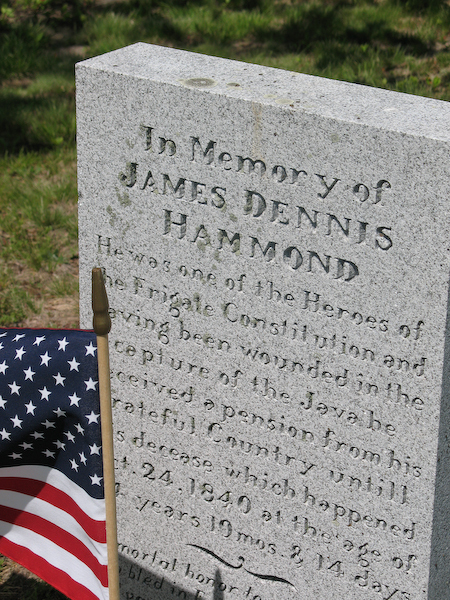 James Dennis Hammond was among the Constitution sailors who trekked west in April. Born into a Marblehead, Massachusetts family of twelve children in about 1785, he followed the example of most of his peers and went to sea at an early age. By 1806 he sailed as mate of the Salem brig Betsey. According to a seaman’s protection certificate filed that year, Hammond was a diminutive fellow, standing only 5 feet 1 inch tall, with a light complexion. When war broke out in June 1812, Hammond was serving on board US Navy Gunboat 85 in Boston Harbor. After escaping from a British squadron off New Jersey in mid July, Isaac Hull brought Constitution into Boston and topped up his crew with more seamen. Hammond came on board on July 30 and three days later Constitution put to sea. On August 19, the Americans fought and captured HMS Guerriere. Hammond remained on board after William Bainbridge took command. On December 29th, he joined his gun crew to serve as a sponger to the No. 10 carronade on the quarterdeck. During the engagement, a splinter tore into Hammond’s left thigh, removing a part of the muscle. The wound appeared clean, however, and thanks to the ministrations of Dr. Amos Evans, he soon returned to duty. Still, his wound must have made climbing and walking difficult. It certainly was no act of kindness to send him with the drafts of men to the Lakes, and the trip must have been a painful experience. Nevertheless, he successfully completed the journey and eventually found himself assigned to the Lawrence, Perry’s flagship. Somehow he managed to escape the slaughter house of the Lawrence’s deck during the battle (two-thirds of the crew were killed or wounded). He is not listed among the men wounded on September 10, but he did collect $214.89 in 1815, his share of the prize money for the victory. Hammond slips out of the historic record for the next fourteen years. By then, his old wound had caught up with him. In November 1829 Marblehead Captain Nathaniel Hooper wrote to the Secretaries of the Treasury and Navy on Hammond’s behalf, to ask how the old sailor could obtain a pension for his services. According to Hooper, Hammond had “become sick and poor…in consequence of a wound received in the Engagement between the United States Ship Constitution and the Java.” He was now living in the town’s almshouse. Amos Evans, who treated Hammond in 1812-13, wrote to explain that while he had been listed among the “slightly” wounded after the Java battle, he had in fact “suffered very considerably with it, and was afflicted with the pains for some considerable time afterwards.” Based on this evidence, the government allowed Hammond six dollars per month for the rest of his life. His final years could not have been happy, but they seemed to have been mildly productive. James Hammond died intestate on October 24, 1840. He owned no real estate, but his personal estate was worth $908.67. After final expenses, there was enough money left for each of his siblings or their heirs to receive $56. Sometime after 1914, the Society of the War of 1812 placed a permanent granite marker on his grave on Marblehead’s Old Burial Hill. Surprisingly, it makes no mention of his service on the Lakes. Still, the inscription is a fitting tribute to all who served during the war. To gain Free Trade & Sailors Rights. Many thanks to Linda Bolla, Education Programs Coordinator at the Erie Maritime Museum, for this information.